Hunger is a persistent problem in the United States. In 1999, three percent of U.S. households (more than 7.5 million people) were food insecure with hunger.2(p7) An additional seven percent of households (more than 23 million people) were food insecure without hunger. In all, 31 million Americans, including 12 million children, did not have enough food to meet their basic needs. In response, PARTNERS IN ENDING HUNGER (a grass-roots organization with over 17 years of experience) has declared itself an organization accountable for providing communities with the tools and training necessary to create and implement effective action plans for ending hunger (see Appendix A). Two essential tools for this work are: (1) a direct and accurate way to measure hunger in a community and (2) criteria that define when hunger has ended. 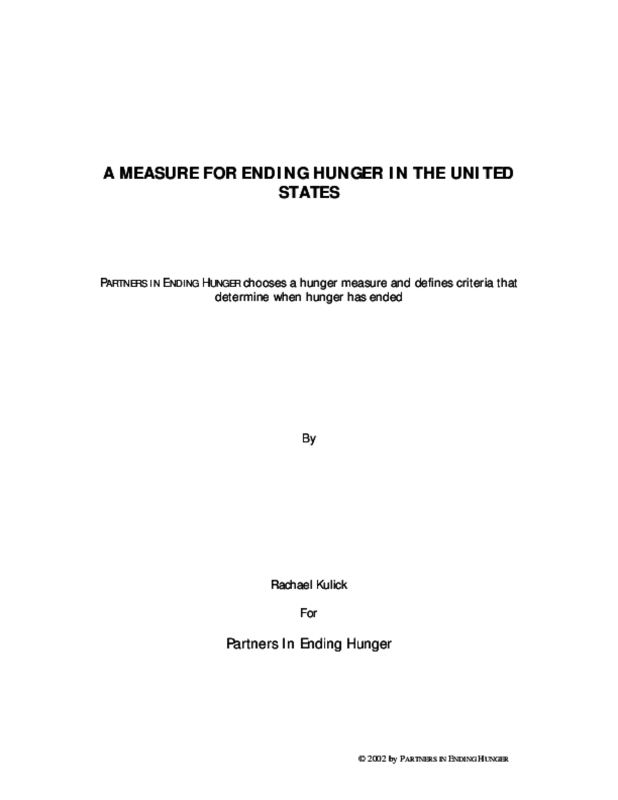 The hunger measure PARTNERS has chosen is the U.S. Household Food Security Measure. It is a survey instrument and severity scale developed under the joint leadership of the U.S. Departments of Agriculture (USDA) and Health and Human Services (HHS). It has been used to measure the extent of hunger at national and state levels since 1995 and was specifically designed to be used at the local level as well. Building on distinctions and definitions presented in the U.S. Household Food Security Measure, PARTNERS has established criteria that define when hunger in a community has ended. According to PARTNERS' criteria, a community has ended hunger when, for two consecutive years, the results of the U.S. Household Food Security Measure show that none of the community's households have members who experience hunger and four percent or fewer of the community's households experience food insecurity. PARTNERS asserts that when communities meet these criteria and sustain these results over time, they have ended the persistence of hunger. These communities will then serve as models and catalysts for other communities to do the same. Copyright 2002 Partners in Ending Hunger. All rights reserved.